Andrew Gaiser, Pharm.D., has been recognized as one of the top 15 winners of the prestigious United States Public Health Service (USPHS) Excellence in Public Health Pharmacy Award. 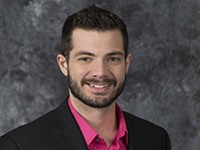 A 2017 graduate of Duquesne University School of Pharmacy, Gaiser received the award in recognition of his work with naloxone rescue and hepatitis C screening. "For naloxone rescue initiatives, I worked in a team to develop programs that we held on and off campus to provide naloxone rescue training to attendees," said Gaiser. "We were able to offer them the chance to get hands-on experience with the placebos, as well as cover information about the opioid epidemic as a whole. Additionally, I was able to take part in a systematic literature review examining the ethical and economical perspectives regarding coverage policies related to expanded naloxone access efforts." Gaiser said that his efforts regarding hepatitis C screening were focused more around adherence, stating, "I was able to conduct research on the effectiveness of a pharmacist-run adherence program in the hepatitis C population. Additionally, at an internship, I was able to assist with tracking patients' sustained virologic response labs as a measure of treatment response, as is required reporting for state Medicaid." Gaiser is currently a Postdoctoral Fellow in Health Outcomes and Market Access at Xcenda in Tampa, Florida.